Bay Eye Care — Why Choose Bay Eye Care? Bay Eye Care is not your usual optometry practice. There is more to optometry than just picking a new pair of glasses. Vision is our most precious sense and at Bay Eye Care we believe it is our duty to examine your eyes as thoroughly as possible and give you unbiased advice and expert care with a medical focus. A view into Bay Eye Care's technologically advanced consulting room. Learn more about our practice in the recent Small Business Tauranga showcase. Click here. We concentrate on offering premium services and eye care solutions to our patients. Our optometrist Mr Alex Petty is an expert in specialty contact lens treatments for conditions like keratoconus, orthokeratology (overnight corneal reshaping), myopia control strategies, and dry eye and blepharitis therapies. On top of this he has years of experience diagnosing and treating other eye problems such as eye infections, glaucoma, retinal disease, children's/binocular vision problems and the ocular effects of diabetes. Even if you have relatively 'normal' eyes a general eye examination at Bay Eye Care will be a detailed and thorough evaluation of your ocular health and visual requirements. We do not sell glasses. One of our key points of difference is that Bay Eye Care does not sell spectacle frames or lenses. In the event that our optometrist suggests that your glasses need updating you can be assured that this is based on clinical evidence, not a profit-driven business decision. In this instance Bay Eye Care is fortunate to have a network of excellent general optometry practices nearby that will happily assist with your new spectacles based on our clinical information. Alex examining the OCT scan of a patient's retina. Unrivalled technology in eye care. In order to offer our premium services Bay Eye Care has invested heavily in cutting-edge technology for diagnosing and managing your eye problems. As a result Bay Eye Care's consulting room is one of the best equipped in the country. We routinely use retinal and corneal OCT scans, photography of the front and back of the eye, instruments to measure the shape and length of your eye, automated machines to find your prescription and check your vision and a host of specialised dry eye diagnostics and treatments (including TearLab tear osmolarity testing and IPL therapy) and contact lens options. For more information visit our Technology at Bay Eye Care page. The view for someone having the shape of their corneae measured by Alex. Bay Eye Care is, and always will be, owned and operated by kiwis, for kiwis. We are not controlled by a faceless overseas company: our friendly optometrist Mr Alex Petty is also the director of Bay Eye Care. Alex is at the coalface ensuring the highest quality service and products are offered to our patients. The majority of Bay Eye Care's rigid and Ortho-K contact lenses are locally manufactured in Christchurch by New Zealand company Contact Lens Corporation, and are designed using cutting-edge lens design software Eyespace, which is in part developed and owned by New Zealanders. Our practice supports optometry education, by providing teaching services for the University of Auckland's School of Optometry and Vision Science for final year students of the Bachelor of Optometry degree. We are active in the Bay of Plenty community sponsoring local events (Tarnished Frocks and Divas), sports clubs (Mount Maunganui Golf Course) and charities (Tauranga Westpac Rescue Helicopter). 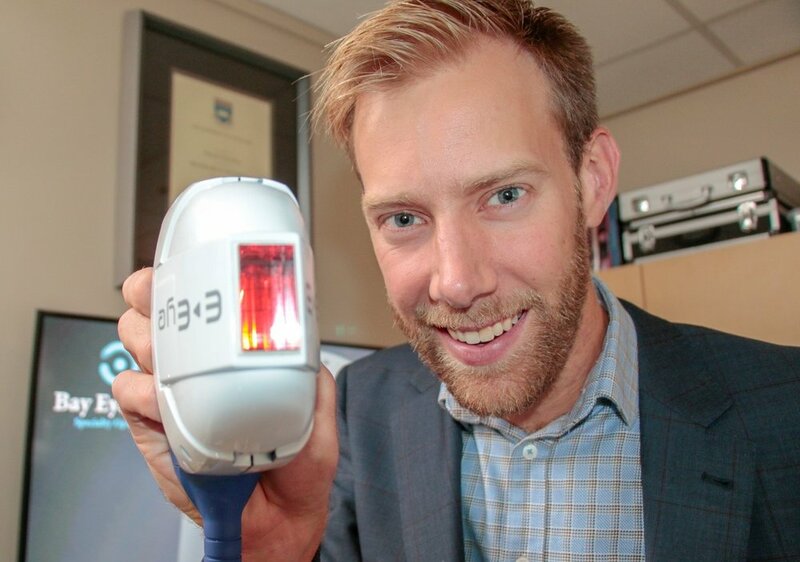 Our optometrist Mr Alex Petty with the IPL applicator for treating dry eye. Do you value premium quality healthcare?